CFN - CALIFORNIA FIRE NEWS - CAL FIRE NEWS : CRITICAL FIRE WEATHER WARNING: IMPERIAL COUNTY AND EASTERN RIVERSIDE COUNTY. 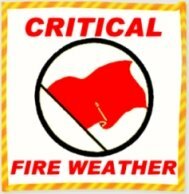 CRITICAL FIRE WEATHER WARNING: IMPERIAL COUNTY AND EASTERN RIVERSIDE COUNTY. AREA: AFFECTED AREA IN CALIFORNIA IMPERIAL COUNTY AND EASTERN RIVERSIDE COUNTY. WINDS: SOUTHWEST 20 TO 30 MPH WITH GUSTS UP TO 45 MPH. TIMING: STRONG GUSTY WINDS WILL DEVELOP THROUGH THE MORNING WITH THE STRONGEST WINDS EXPECTED IN THE AFTERNOON. RELATIVE HUMIDITY: AS LOW AS 13 PERCENT. IMPACTS: FUELS ARE VERY DRY AND FIRE DANGER IS HIGH. THESE CONDITIONS COMBINED WITH LOW RELATIVE HUMIDITY AND STRONG WINDS WILL LEAD TO WIDESPREAD HAZARDOUS FIRE WEATHER CONDITIONS.